Last time, I wrote about the sometimes bridge between psychological research and practise. I pointed out that many psychologists practise based on nonscientific beliefs, instead of sound, evidence-based protocols. Again, last week, I pointed out that many psychologists practise in almost complete ignorance of neuroscience. Few psychologists would be able to describe the brain’s structure, the basics of how it works, its major systems, or modern theories on brain processes and their effects on behaviour. As a consequence, these psychologists end up a lot like a programmer who knows nothing about the underlying hardware of the machine being programmed. This isn’t disastrous. After all, good programmers don’t need to know much about the hardware to create good software. It helps, however, when they know how the hardware can interfere with the effectiveness of their programs, and how to tweak the software to take advantage of various hardware features. Likewise, psychologists don’t need to be experts in neuroscience, but it helps to have a grounding in the basics, so that they can adjust their practices to compensate for hardware ‘issues’. OK – the hardware/software analogy can only take us so far. The brain isn’t really like a modern computer. It’s squishy for a start, and runs on a combination of electrical (like a computer) and chemical signals (not like a computer). Moreover (and importantly), the hardware/software distinction in the brain can get blurred. Because the human nervous system (or which the brain is a very complex part) is adaptive, changes in the hardware can modify the software and, much more interestingly, changes in the software can modify the hardware – making the whole system a bit more like ‘mushware’. But, squeezing a little bit more out of the computer analogy, with appropriate knowledge, psychologists can be thought of as software engineers, and psychotherapy as a sort of software ‘patch’ or ‘upgrade’. It would probably help, at this stage, to give you a small background in the way the brain works. I’ll do this from both a macro (large systems) and micro (individual components) perspective. Let’s start with the micro. Your brain is formed a billions of individual cells known as neurons (actually there are a heap of other cells in there including important ones called glial cells, but this isn’t a textbook). 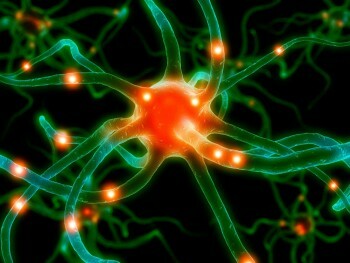 Neurons work a teensy bit like a transistor, they either allow an electrical signal to continue along a circuit, or not. A neuron is connected to other neurons via synapses: small ‘gaps’ between neurons that let neurons communicate via chemicals called neurotransmitters. Typically, when a neuron is activated, an electrical signal travels down one of its arms (dendrites), along the cell body (the axon), and toward the synapse. This signal causes the presynapse to release a spray of chemicals (neurotransmitters) into the synaptic gap. These chemicals are specific to the cell (there are lots of different types, including serotonin, dopamine, GABA, endorphins, noradrenaline, etc.) and have a particular shape. On the other side of the synaptic gap (on the next neuron) are receptors (which have the same ‘shape’ as the neurotransmitter, a lot like a key entering a lock). When enough of the neurotransmitters bind to enough receptor sites, an electrical signal is stimulated and continues along a ‘circuit’. This is called neurotransmission. OK, that’s ridiculously simplified. In reality it’s massively more complex and includes a thing called secondary neurotransmission that involves the activation of genes and the expression of proteins in the neuron (and we’re still learning how it really works). But for the sake of simplicity, let’s say that the brain forms complex electrochemical ‘circuits’ via activation of neurons. There are many different specialist types of neurons, many of which group together into particular regions in the brain. At its most basic, the brain is divided into three sections, that reflect its evolution. At the base is the basebrain, something we share with reptiles, and which is responsible for most of the automatic systems in our body (e.g., breathing, blood pressure, hormone balance, etc.). We don’t have any ‘consciousness’ in this part. Above that is the limbic system – the supposed ‘monkey brain’. This evolved to help us survive, and it’s the cause of most of our problems in the modern world (read here for a good overview of this system and its effects). Above this is the neocortex (literally new wood), the most recently evolved and, combined, probably one of the most complex structures in the universe. It’s a common mistake to assume that the brain is a unified system. In fact, even within each of these ‘layers’, it’s a collection of highly specialised modules. Some of these modules are well networked, and others are more difficult to access. Moreover, some of the modules understand each other, whilst others have ‘compatibility’ issues. We often assume that our brains are fully integrated because we experience the illusion of internal integration. It feels like there’s just one person inside your head. In fact, the bit that you call ‘you’ (assuming ‘you’ exist at all – read here for an overview) probably exists somewhere in your prefrontal regions. This ‘you’ module gets information from a lot of other modules, and the result is your ‘experience’ of the world. The problem is that ‘we’ treat most of this incoming information not as messages from other brain regions, but as a part of ourselves. So, when we ‘feel’ angry, we assume that we are angry, and act accordingly. In fact, like most of the other emotions, anger is just information from a system in your midbrain (the amygdala in the limbic system) that has been activated based on its limited danger-detection system. In other words, our emotions are nothing special – just warnings of potential danger so that you will take action. In fact, it’s best to think of them as “e-motions”, messages that “evoke” motion (like “run away!”). Yeah, yeah you’ve heard this before (and I’ve written about it a lot) – and it doesn’t really help because it all feels so real. It’s hard to work effectively with your limbic system because it’s really another, primitive ‘you’ that doesn’t think clearly, but which has executive override. When it’s really active, ‘you’ get shut down (seriously, this is what ‘fight or flight’ is – and it results in deactivation of the prefrontal cortex where ‘you’ live), meaning ‘you’ don’t get to make decisions or control your actions. This is why you (and me) do and say really dumb things when you’re stressed. I started by suggesting that psychologists need to understand a bit about the hardware to be better software engineers. In fact, psychologists work by helping people deal with emotions and behaviours. But how can they do that properly, if they don’t understand something about the origin of those emotions, and the way in which they interfere with behaviour? Now we get (I hope) to the interesting part. Understanding something about the hardware is great – but understanding it won’t fix the software. This is where the mushware comes in. Good psychologists modify your mushware by getting access to your individual hardware modules through the software! This is the weird part, because a lot of human functioning is predicated at the hardware level (i.e., automatic stuff that we have no control over). ‘We’ get information about this activity, and assume that we were the ones that initiated it – and we’re wrong. In fact, it’s probable that this software that runs ‘us’ is just an evolutionary fluke, but it’s a really useful one, because it does have a link to the hardware in terms of manipulating the basic operating parameters. In other words, what this software (potentially) does well is to observe what’s going on and, with appropriate awareness, it can interfere with hardware output. Human programming, therefore, is the ability to use our awareness of internal processes to modify our gross behaviours. Because most of human functioning is closed to us (it’s like a black box system where we can only observe the inputs and outputs) we can look at the outputs and potentially insert an alternate into the output stream. Psychologists can’t do this directly (at least not yet – read here) so, by using appropriate suggestions, we need to get our clients to do it for us. In other words, we’re using the very limited bandwidth of human language to try and run a script on our client’s ‘self’ module that helps him or her to learn to interpret the outputs of the various brain systems differently. When this is done well, our clients can learn to modify the way they function in different situations. Now comes the really interesting bit. The very act of observing internal functions (noticing our thoughts, emotions, actions, etc. ), and then applying a different action to the one we would normally default to, can result in hardware modifications (hence the mushware analogy). Because the brain is a dynamic computer, the software is actually a part of the hardware and vice versa (again, mushware). When the software changes, the hardware has to change, and sometimes we can make improvements. For example, in treating depression we actually improve the functioning of the hippocampus; treating anxiety results in a lowering of amygdala output; and treating obsessive-compulsive disorder (OCD) leads to modifications to the anterior cingulate cortex to reduce misfiring. There’s a caveat here. Software override is really hard, because of the fact that so much happens at a purely hardware level (unavailable to consciousness). It’s especially hard in the times when we really need it, like when we’re under pressure or stress, or in pain, or in danger. The times when we really need to be aware and available, to interfere with our default actions, are the times when ‘we’ get switched off. This makes evolutionary sense from a survival perspective (for most of our evolution survival required running away rather than reasoning), but isn’t much use to us in the modern world (where reasoning is really useful in difficult situations). We can learn though – at least to a reasonable degree – through a lot of repeated practise. This means exposing ourselves to increasing levels of difficulty and retaining full awareness throughout. This is why pilots train in simulators, and soldiers do live-fire exercises. With enough training, any stressful situation can become mundane, allowing executive control instead of limbic system override. It is hard, and it takes a lot of commitment and, well, awareness! So, with all of that in mind, if we can learn to intervene in order to retain prefrontal activity in difficult situations, we can be a lot more effective. Thus, psychologists need to understand basic brain principles, and the effects of hardware activation on software functioning, in order to be effective in the treatment of their patients – there’s no point in teaching a person stress-related techniques that require higher brain functioning to work, if those areas aren’t available during stress!